Fenwick Equestrian's Liquid Titanium Far InfraRed wearable products incorporate a patent pending technology which has resulted in the production of a lightweight, breathable therapeutic Skull Cap using our Liquid Titanium smart fabric. 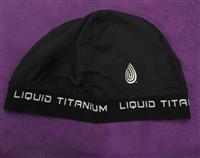 Fenwick Equestrian's Liquid Titanium headgear has been so succesful that we have made a therapeutic Liquid Titanium Skull Cap for atheletes. It can be used for many symptoms, from relief of headaches and stress to giving you a boost of energy. The benefits of Liquid Titanium vary from person to person, but read on if you are interested in a "naturally healing" product that may help you! Through our extensive testing, we have discovered that the use of this high performance fabric in a head covering has produced a calming effect "naturally", which enables one to relax and focus. The new cap is constructed from our moisture wicking, breathable liquid titanium fabric which brings the latest technology to headwear. Liquid Titanium produces Negative Ions which have been proven to make us feel better by providing us with more energy and a positive mood. Think of when you are at the beach and the air smells so clean, or after a rain shower and everything seems so fresh. This gives you an idea of what negative ions can do for you. Then, think of how you feel being in a centrally heated or air-conditioned office all day, every day. You can't wait to get outdoors and breathe fresh air! Statistics have shown that when ionic air purifiers are used in offices, people's performance rate is 25% higher. We can only absorb 15% through breathing, but by using the skin to absorb negative ions, we can absorb up to 100%. Liquid Titanium also produces Far Infrared Rays (FIR) which is a light energy and are considered essential to our well being and health. The energy is easily absorbed by the body through "resonance absorption", which is a "vibration" of our cells and FIR rays at the same frequency. Once these rays penetrate our body they activate the molecules and body cells thus producing a varying degree of warmth. Once the blood flow is improved the rest of our body can begin to heal itself. It is like the domino effect. Everything begins to function properly. Liquid Titanium is baked into our specially designed fabric at a very high temperature, allowing one to continually wash and dry the product without diluting the qualities. This performance fabric functions equally as well, whether it is wet or dry. Also, there is no limit to the length of time one can wear this hat. During the testing stage of this product, the hat was successfully worn all day with excellent results. "A healthy, relaxed and focused person feels and performs better!" Increases the production of nitric oxide which is a key component of a healthy Immunesystem. Detoxification_Helps flush toxic substances from the body. Induces alpha brain waves and stabilizes seratonin levels which can create a calmingeffect. Can relieve anxiety and stress.